Six months ago, Max Hazan shifted his workshop from Brooklyn to Los Angeles. But the cross-country trip barely interrupted his stride. 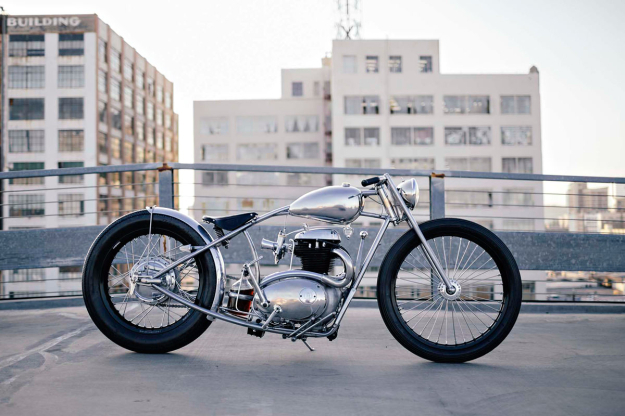 This stark and beautiful BSA A50, the first build to come out of Max’s new LA shop, was completed in just five weeks. It’s a commissioned bike, built for a client who already has a Hazan XS650 in his garage. And with such a short deadline, there was no time to shop around for parts. Instead, Max had to build everything from scratch—and being a master craftsman and artist, that’s how he likes it. 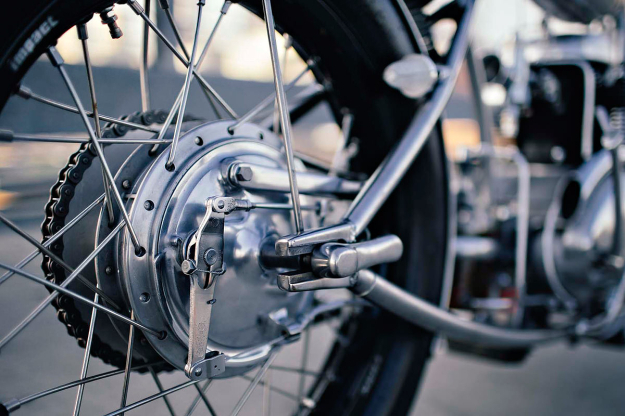 The design is the simplest form of a motorcycle, with the shapely BSA motor being the center of attention. Attracted to the lines of the cases, Max selected a 1966 A50 engine to use as the foundation of the build. 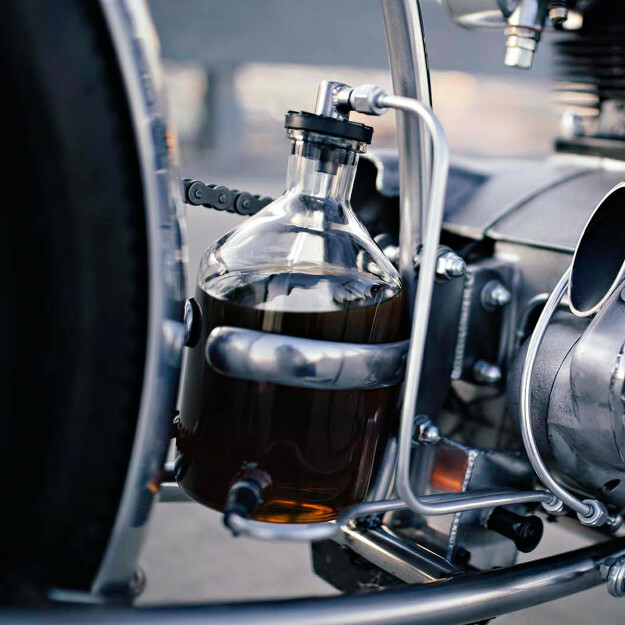 The cleanest way to mount the gas tank was to make the tank part of the frame. There’s a sediment bowl from a tractor right below the tank, feeding fuel via hand-formed aluminum lines direct to the single Amal Monobloc carburetor. 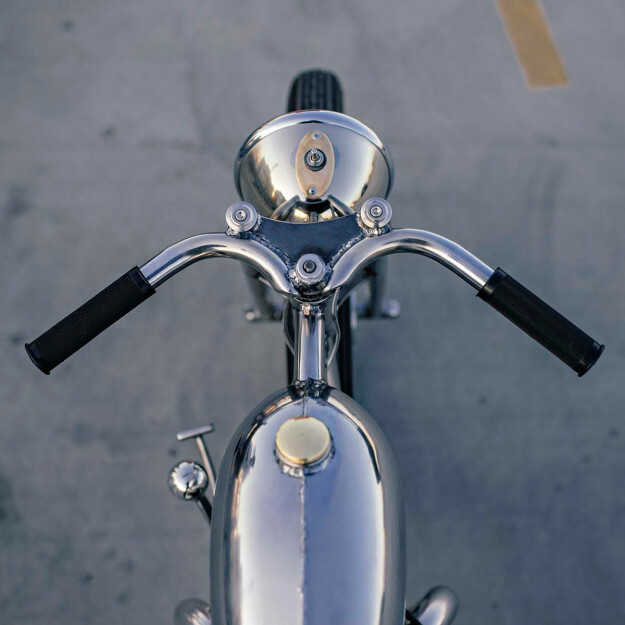 The bars are super-clean, cleverly machined with hidden parts and cabling routed through the frame—an approach Hazan also used for his acclaimed Harley Ironhead. Another remarkable detail is the oil ‘bag.’ Lab equipment has always intrigued Max, so he’s used an aspirator bottle rather than the traditional steel or aluminum tank. It’s a bold move, but something about it is just right: Movement of the liquid, usually hidden, is now visible. And then there’s the exquisite hand-formed plumbing and mounting hardware surrounding the bottle. The kickstand is another first. 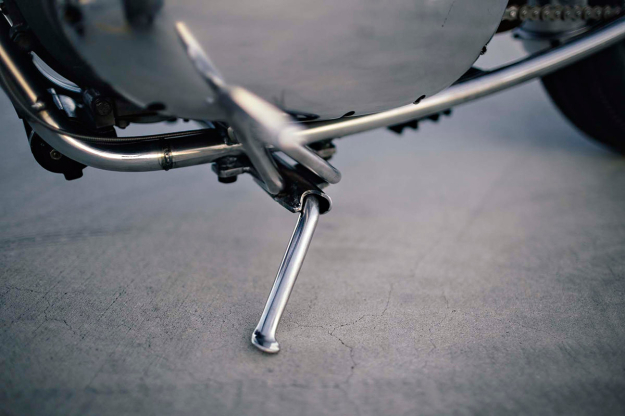 Max made a bolt-action piece to avoid dragging metal during turns on the low-profile BSA. And the rear fender is mounted to the axle spacer, so you can move them both when making adjustments. A Honda CB350 front drum brake was re-machined and adapted for use as a rear hub; up front is a modified Harley hub. 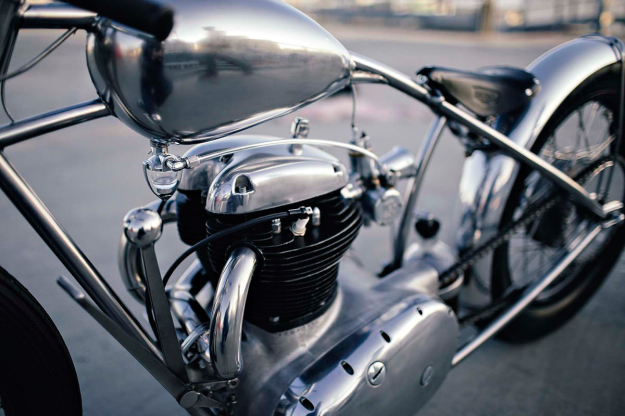 The 2-into-1 exhaust system is equally elegant, curving around the righthand side of the BSA motor. The placement is perfect, with the angles and bends almost defying geometry. The axle stoppers are inside the dropouts, so you can’t see them. And the best thing about the rear end? Max made it so that no tools are needed to take the rear wheel off. Just twist and off it comes. 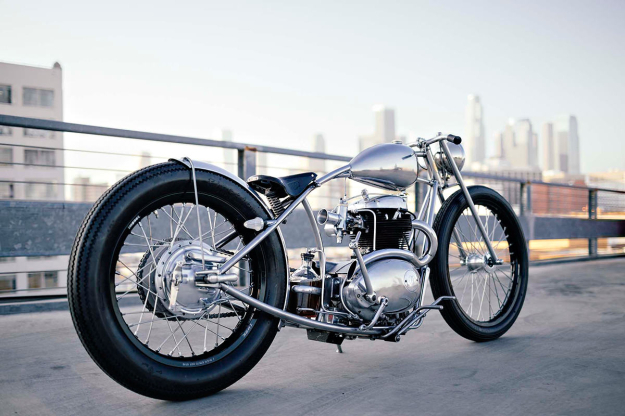 This BSA is riddled with more detail than space permits to write about. Take a closer look—you’re sure to find something we’ve neglected to mention. Images by Shaik Ridzwan. Visit the Hazan Motorworks website or follow Max’s news via his Facebook page.